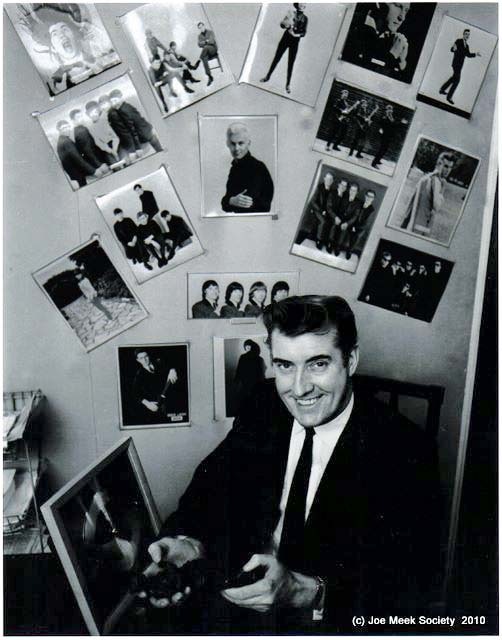 Joe – was born Robert George Meek in Newent, Gloucestershire, England 5.4.1929 and died in tragic circumstances on 3.2.1967. He is most remembered by the number one hit Telstar by The Tornados but that was only the tip of the iceberg. 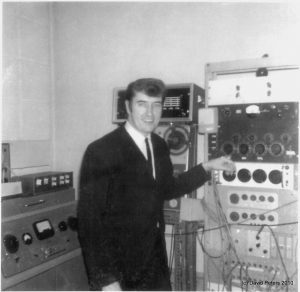 Joe started engineering hit records by the likes of Frankie Vaughan, Tommy Steele, Shirley Bassey, Anne Shelton, Humphrey Lyttlelton, Chris Barber and Lonnie Donegan in the mid fifities. As an engineer he started to develop his amazing techniques which all began as a child when wiring up the cherry orchards in his beloved Newent. 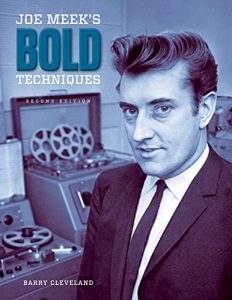 In January 1960 as a producer he formed his own record company Triumph Records and had a big hit with Michael Cox’s Angela Jones. Joe then formed RGM Sound Ltd and Meeksville Sound Ltd. moving into 304 Holloway Road where he both lived and worked above a leather goods shop. Here Joe produced a great volume of work. Joe’s first hit from this location was a number one – John Leyton’s Johnny Remember Me written by Geoff Goddard who collaborated with Joe on a lot of songs. Joes’s recording techniques were ground breaking and a Meek produced record stood out when heard on the radio. There seems to be a Meek connection with most artists in the sixties. He turned down the Beatles and Rod Stewart amongst others but the number of artists who trudged up the stairs at 304 is vast and we are still uncovering them. There are 64 teachests full of unreleased tapes and who knows what treasures await unrevealling. From the corners of the country they arrived at 304 Holloway Road – then The Great North Road and a very busy part of London. Imagine yourself a budding musician with high hopes of success and a little nervous as you cross the busy street and approach number 304…..
– in actual fact the list is endless and the many aspects of Joe’s life are too numerous to detail here and we can only give an overview on this site. 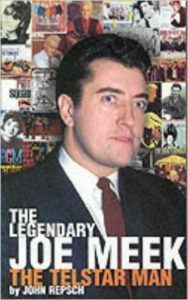 There is no substitute for joining the Society if you are even remotely interested in the life and times of Joe Meek- the information you can read about Joe on the internet is vast but only the tip of the iceberg, our quarterly magazine (free to members) is packed with information – as are our newsletters. We are constantly discovering new facts and former artists with Joe are making contact and telling their stores. 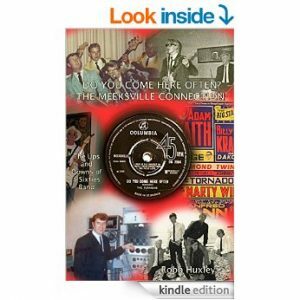 Robb Huxley has written his story here – and his first book covering the Joe Meek years, Do You Come Here Often – The Meeksville Connection is also available in e-book and paperback format at all Amazon sites worldwide.